Remember when Apple’s Tim Cook referred to Microsoft’s Surface tablet as the equivalent of marrying a refrigerator with a toaster? My how the times have changed: Apparently responding to the success of Microsoft’s Surface Pro line, Apple has debuted its own refrigerator-toaster called the iPad Pro. Now Microsoft itself is firing back — and upping the ante — with its new Surface Pro 4. The follow-up to the excellent Surface Pro 3, the Pro 4 is thinner, more powerful, and more attractive than its predecessor. With it, Microsoft isn’t just taking aim at Apple’s new iPad: Apple’s MacBook Air is in its sights, too. And after spending a week with the Surface Pro 4, I’m convinced that Tim Cook and company have their work cut out for them. Microsoft’s Surface Pro 3 was a beautiful device; with the Surface Pro 4, the company has perfected that design in all the right ways. Up front, the Surface’s touch screen has increased from 12 to 12.3 inches. Microsoft managed to do this without growing the tablet’s footprint, by making its bezel a bit thinner. With its optional keyboard cover, the Pro 4 measures 0.52 inches thick and weighs 2.41 pounds. The MacBook Air 13-inch, by comparison, is 0.68 inches thick and weighs 2.96 pounds. No, the Surface Pro 4 isn’t much thinner or lighter than the MacBook Air 13-inch, but when you’re traveling every ounce and inch count. 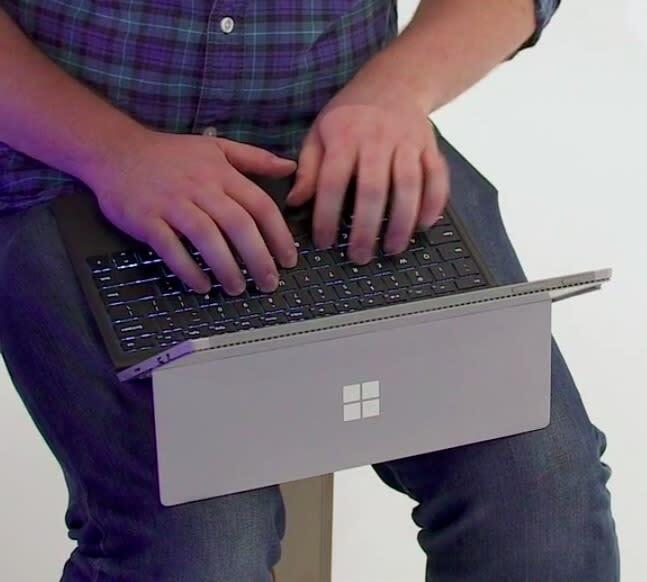 The one problem I have with the Surface Pro 4’s design is that its kickstand makes it incredibly hard to use on your lap. Yes, it’s the same complaint people have had since the first Surface Pro came out in 2012, but it’s still worth mentioning. By comparison, I can use my MacBook Air on my lap while riding on the bus; the Surface’s kickstand and detachable keyboard make that too difficult. On a desk or table, though, the Surface is great. The Surface Pro 4 comes equipped with Microsoft’s 12.3-inch PixelSense touchscreen display, with a resolution of 2736 by 1824 pixels. Text looks sharp and images and video looks perfectly clear. Colors on the Surface Pro 4 are bright and vivid, while blacks are incredibly deep. Seriously, you’ll have a hard time telling the difference between the black toolbar at the bottom of the screen and the Surface’s bezel: It’s that dark. The screen on Apple’s MacBook Air, meanwhile, has a resolution of just 1440 by 900 pixels. As a result, text and images don’t look nearly as crisp. Colors, though, still look wonderful on Apple’s laptop. The iPad Pro’s 12.9-inch display has a 2732 x 2048 resolution, which should make for impressive images. No matter how much Microsoft wants the Surface Pro 4 to compete with traditional laptops like the MacBook Air, the company still doesn’t sell its tablet/laptop with a keyboard: You still have to shell out $130 for the Surface’s Type Keyboard — which is a bummer, because it ups the “real” base price of the Surface Pro 4 to $1,030. On the plus side, Microsoft did a wonderful job improving the feel of the Surface Pro 4’s Type Keyboard. The keys are now separated from each other rather than touching, which makes typing more comfortable. 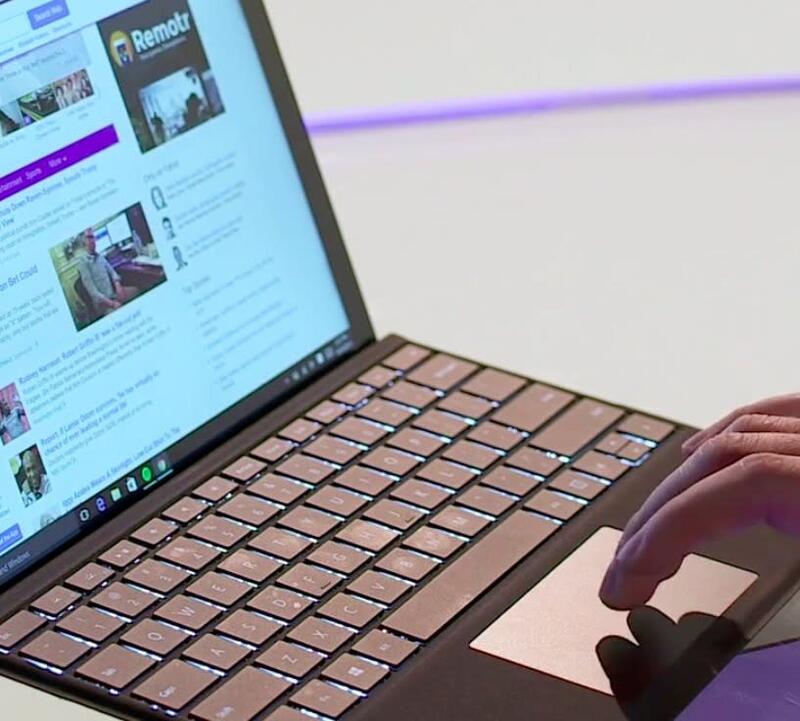 Microsoft has also increased the size of the Type Cover’s touchpad — now covered in glass — so you don’t have to reposition your finger to move the cursor from one side of the screen to the other. Seriously, this touchpad is so responsive and smooth, it easily rivals the MacBook Air’s (which is fantastic). Beyond the standard Type Cover, Microsoft is going to offer a Type Cover with a built-in fingerprint reader, though pricing for that isn’t yet available. Like every other Surface before it, the Surface Pro 4 is also compatible with Microsoft’s Surface Pen stylus. But for the Pro 4, Microsoft has drastically improved its Pen to feel more like an actual, well, pen. The new Pen, which is a $60 optional accessory, recognizes 1,024 levels of pressure, which means it can understand when you press harder on the pen, making the ink darker and thicker. Microsoft has also increased the resistance between the Surface’s screen and the pen, so it feels more like a pen writing on paper, rather than on a slippery surface. 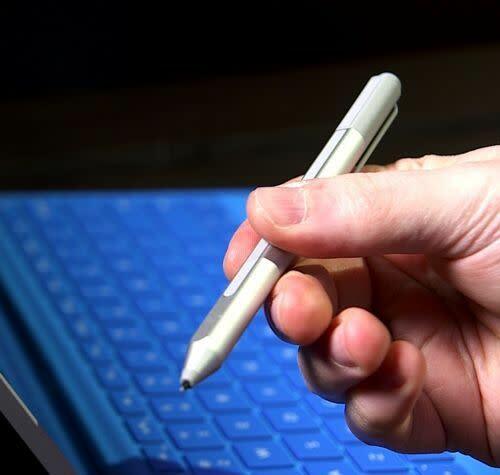 Microsoft even added an eraser to the pen that actually works. A pen with an eraser — how novel. The new pen, according to Microsoft, also gets up to one year of battery life out of its AAAA battery (yes that’s four A’s), something the company says is a nod to the ink running out of a real pen. Perhaps the biggest improvement to the Surface Pen, though, is the new built-in magnet that allows you to connect the stylus to the side of the slate. That means you’ll no longer have to cram your stylus into a loop connected to the Surface’s keyboard. My only fear is that I’ll accidentally knock the pen off while carrying the tablet to and from meetings or that it’ll fall off and disappear into the black hole that is my bag, never to be seen again. Still, the Surface Pen is fantastic and as such, well worth buying. 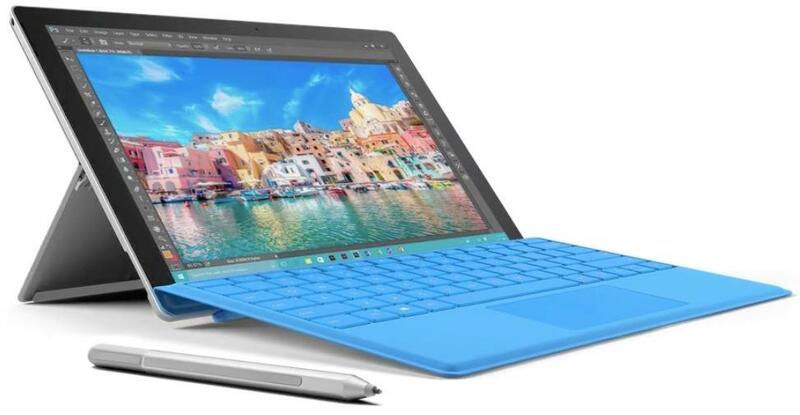 Microsoft is offering several different configurations of the Surface Pro 4. The base version, which costs $900 comes with an Intel Core M processor, 4 GB of RAM, and a 128 GB solid-state drive. Intel’s Core M processor is far from the most powerful chip on the planet, so you’ll likely want this model for simple web browsing and word processing. The next step up from there is a $1,000 model that switches out the Core M processor for a more powerful Core i5 chip. That’s the same price you’ll pay for a similarly equipped MacBook Air. If you want to go all out, you can get a Surface Pro 4 with a high-powered Core i7, with 16 GB of RAM, and a 1 TB storage drive for a whopping $2,700. With that kind of setup, your Surface will be powerful enough to outclass most any laptop on the market — yet it’s still technically a tablet. You can’t even buy a MacBook Air with that kind of power. In fact, if you did want that kind of performance from a MacBook, you’d have to jump up to a $2,700 MacBook Pro. 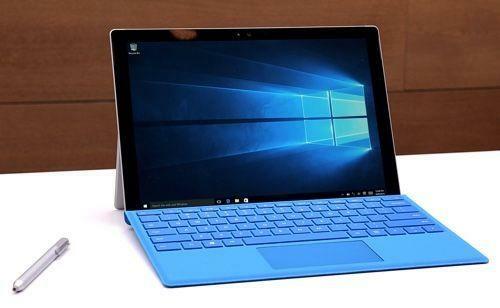 Microsoft says the Surface Pro’s battery will last up to 9 hours while watching video. I personally got about 6 hours of use from my review unit, which included browsing the Web, typing, and watching video. That’s about equal to what I regularly get on my MacBook Air. Microsoft’s Surface is easily the best productivity tablet you can buy. But it’s also one of the best laptops you can buy. I’ve been using one in place of my MacBook Air and I can’t say I miss the Air much. In fact, the only time I had a problem with the Surface Pro was when trying to use it on my lap. Microsoft has truly created a versatile machine that works well as both a tablet and laptop. If you’re in the market for a new lightweight device, and you aren’t wedded to Apple, you’re going to want to check out the Surface Pro 4. Email Daniel at dhowley@yahoo-inc.com; follow him on Twitter at @DanielHowley or on Google+.